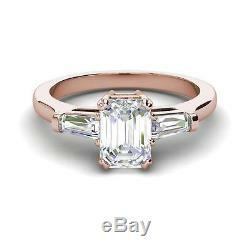 Baguette Accents 2.25 Ct VVS1/D Emerald Cut Diamond Engagement Ring Rose Gold. This stunning, Baguette Accents 2.25 Ct VVS1/D Emerald Cut Diamond Engagement Ring Rose Gold 2.25 carat Emerald cut natural diamond engagement 14k Rose Gold ring features a 1.75 carat Emerald cut center stone with an VVS1 clarity, D color with accented stones totaling approx. 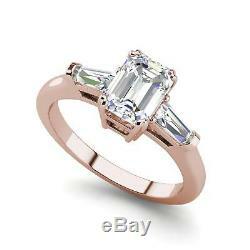 0.5 tcw, VVS1 clarity, D Color giving this amazing ring a total of 2.25 tcw. All other international orders may vary based on location. We only sell the highest quality in diamonds, which all have excellent clarity and color. 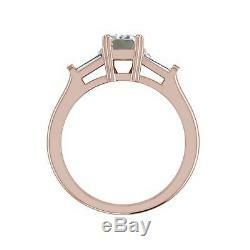 The item "Baguette Accents 2.25 Ct VVS1/D Emerald Cut Diamond Engagement Ring Rose Gold" is in sale since Tuesday, November 20, 2018.